This fall, we take you behind the scenes with our long-time partners in Pakistan whose work is made possible by your support. Thank you! When Shafqat Hussain was a boy, growing up in the lowlands of Pakistan, his schoolmates called him Jungly—wild man. At the same time, Ghulam Mohammad was growing up in a small village high in the Karakorum Mountains. Being a strong child, he was sent to the pastures to tend the livestock—a job more important than attending school. When a flood destroyed half his village, Ghulam’s family moved to the town of Skardu on the Indus River. With no livestock to tend, Ghulam enrolled in primary school and thus began to satisfy his curiosity and passion for education. 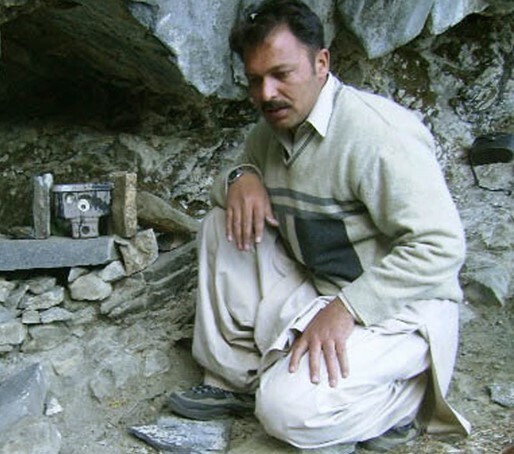 The two men met in Baltistan shortly before Shafqat launched Project Snow Leopard in 1998. Livestock insurance was the initial focus in a region where households earn about $500/year. A family’s herds are the equivalent of their life savings. 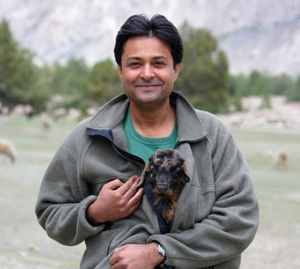 Shafqat founded Full Moon Night Trekking whose profits would supplement the premiums paid by herders, based on 1% of the value of one goat. This program earned Shafqat a Rolex Associate Laureate Award in 2006. A key aspect of Project Snow Leopard’s success is local participation at every level, including control of the income from their eco-tourism enterprise, Full Moon Night Trekking. 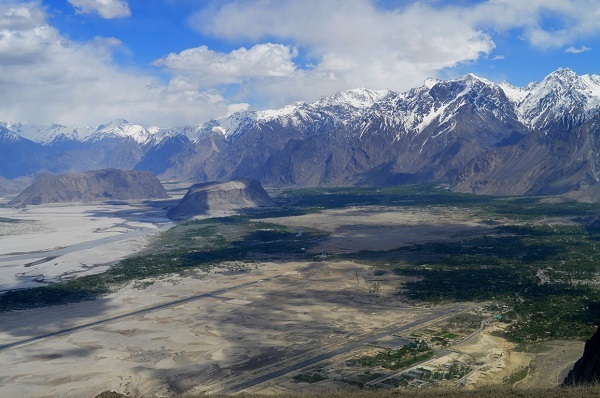 This aerial view of Skardu illustrates the attraction of Pakistan’s northern areas to mountain climbers and other hardy adventure travelers. The Snow Leopard Conservancy and Project Snow Leopard have collaborated since 2003. Your donor dollars have enabled conservation action reaching seventeen villages. 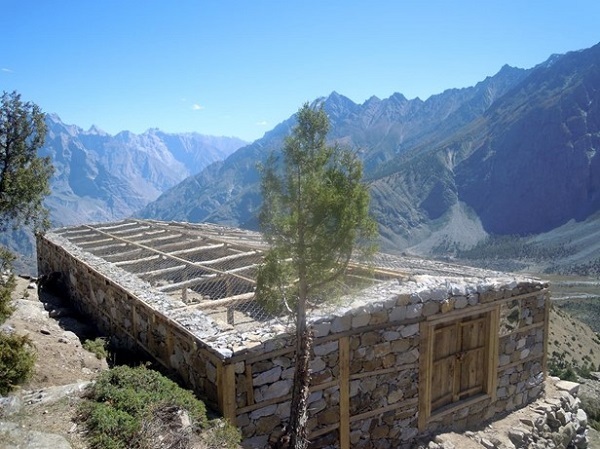 The program now operates under the Baltistan Wildlife Conservation and Development Organization (BWCDO). With Ghulam serving as General Manager, Shafqat remains as a board member and advisor. Fifty livestock corrals have been made secure from nighttime raiding by snow leopards or wolves. Predator-proofed corrals help keep snow leopards alive. BWCDO was one of fifteen recipients—the first ever from Pakistan—to be honored with a 2017 Equator Prize, awarded by the United Nations Development Programme, recognizing outstanding community efforts to reduce poverty through the conservation and sustainable use of biodiversity. This beauty was filmed this past April by one of Ghulam’s trail cameras. Click here to see the video. Ghulam described seeing his first wild snow leopard in winter 2011. We asked Ghulam how he came to be a champion of snow leopards. Environmental Education is a major focus of BWCDO’s mission. 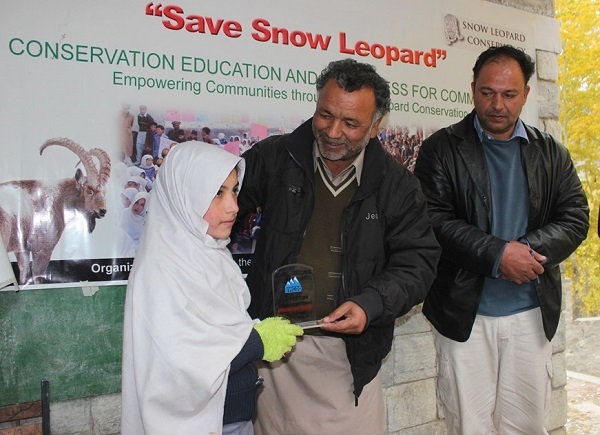 Over the past thirteen years, Ghulam (far right) has trained teachers and conducted activities throughout Baltistan that promote awareness of snow leopards and the mountain ecosystem. Since 2015, he has spearheaded International Snow Leopard Day celebrations, bringing the community together with teachers and students from area schools. 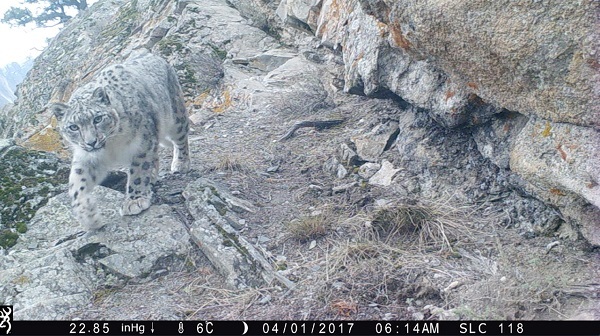 Please help us ensure that the Snow Leopard Conservancy can continue to support this vital work, along with our other community-based programs aimed at helping indigenous people take the forefront in preserving their natural heritage.